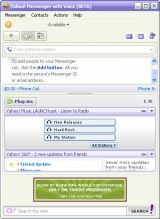 Yahoo Messenger is a free to use software that enables you to see when friends are online and to chat with them. See how skilled your friends are in a bunch of social games, like Backyard Monsters or Pool. Now you are able to chat with your Facebook contact right from your Messenger. Share and update your status with your friends, post comments and keep up with your conversations across Facebook, and Yahoo all from your Yahoo Messenger. Appreciate your conversations on the go over your iPhone, Android or any Internet enabled mobile phone. Always stay signed in to and never miss any dialogue, either you are home, at your office or on your mobile device. The new Messenger comes with a wide variety of new and enhanced features. The photo sharing feature was significantly improved. This new version does not support older operating systems, such as Windows XP. The new version does not work with 3rd party applications, such as Pidgin or Trilian. Yahoo! Messenger has been tested by Download82.com team against viruses, spyware, adware, trojan, backdoors and was found to be 100% clean. Our editors will recheck this software periodically to assure that it remains clean.